Kanye West has so many cool friends and one of them is Ellen DeGeneres. West and his white voice appeared on her talk show on Thursday to discuss his upcoming project and how much he's changed for the better, post-North. He also debuted his music video for "The Only One," and Ellen was kind enough to spit a verse for him about how dope he is. Great friend to have. In the interview, West explains that he's now part of the community of men who've become slightly less fucked up after having a kid. He's "a better human being." He's learned how to compromise ("Beautiful..." says Ellen) and how to shut up more. He's also much more protective of his family. "There's things I've done in the past that were considered negative, but I was really jumping in front of the tank for other people and for culture in a way," he says of his antics. "So now I always have to have that in my mind that I have a family that I have to protect, too." 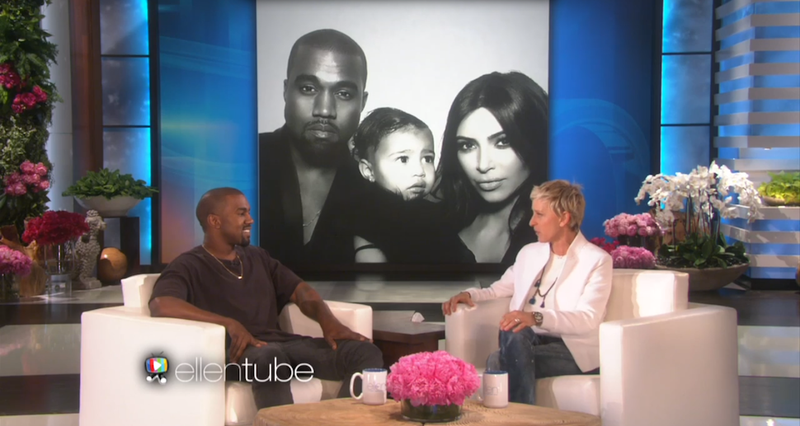 During the interview, Ellen notes that he does seem much calmer and not as angry as he used to be; West describes that phase as "my version of my terrible twos." I doubt that he's truly out of it because Kanye is always gonna Kanye. But, sure. He, of course, also talked about the pushback he's gotten in the fashion world, saying, "You guys were seeing someone be suffocated by perception." Since they're such good friends, Ellen performed a rap she wrote about Yeezy for the BET Honors that he thinks is totally "stuntastic," which is something you tell your friends when you don't want to say, "Uh, nice try?" Ellen raps, "This is a white girl's rap for Kanye West/ I'm gonna try, try to do my best/ To explain the man I see/ The one of a kind, the visionary/ A special man, a human man." Watch her here. And here's the video for Kanye's "The Only One," a song with an emotional, genuine sentiment that hurts my ears. But this features North West, who is cute.